Large yields and growing grain stocks have been a driving force of commodity markets in recent years. Given the multi-year pressure on commodity prices, the annual question of ‘how big will the crop be’ seems to be even more relevant this year. While there is a lot of growing season – and planting – that remains, speculation began months ago. This week’s posts looks at two myths we’ve heard in recent months about yields and the 2017 corn crop. After the May WASDE report, twitter-feeds and coffee shops across the Midwest lit up. The USDA’s first crack at sizing-up this year’s U.S. corn crop included a yield estimate that left many scratching their heads. With history as a guide, the USDA preliminarily estimated the 2017 corn yield at 170.7 bushels per acre (bpa). Many pointed out that, if realized, 2017 would be the third largest yield ever recorded. Compounding the skepticism, 2017 corn planting isn’t even complete. Is the USDA really forecasting a huge yield? Figure 1 – which graphs U.S. average corn yields from 1960 to 2016 – illustrates how the USDA’s estimate can have the appearance of being the “third-highest yield on record.” Only twice before – 2016 (174.6 bpa) and 2014 (171 bpa) – have larger yields been recorded. However, this graph and conclusion does not account for upward trends in yields overtime. 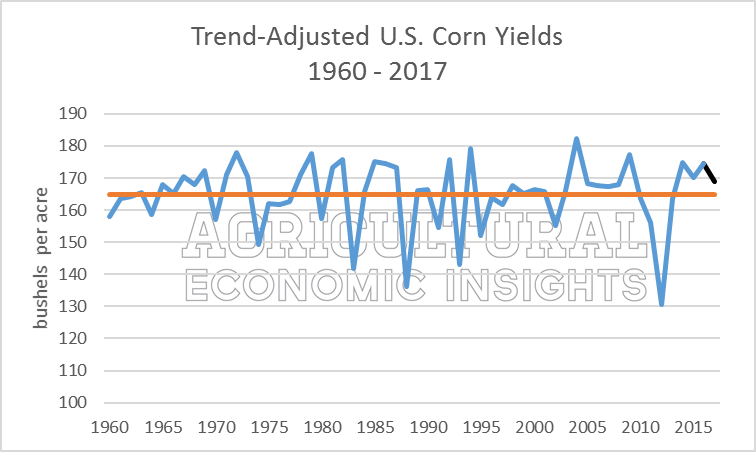 At a trend increase of 1.84 bpa per year, the high yields and records from just a few years ago are masked over time. Figure 1. U.S. Corn Yields, 1960 to 2016. Data Source: USDA NASS. To allow for historical comparisons, trend-adjusted U.S. corn yields since 1960 are shown (figure 2). This graph essentially adjusts historic yields to current, 2016 yields. The impact of not adjusting yield data when making historical comparisons is most evident for 2004. The USDA reported a national corn yield of 160.3 bpa in 2004, a record-smashing 18 bpa above the previous high set in 2003. Over time this record yield was masked by upward trending yields (figure 1). When adjusting for trend yields, however, we can see that 2004 is still record setting (figure 2). In trend-adjusted terms, 2004 is equal to roughly 182 bpa today. Broadly speaking, the USDA’s 2017 yield estimate, shown in black, isn’t a record in a historical, trend-adjusted context. Figure 2. 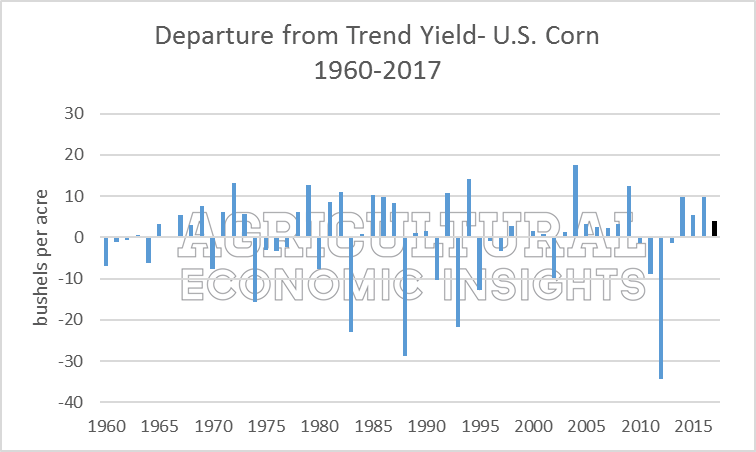 Trend-Adjusted U.S. Corn Yields, 1960-2017. USDA’s May 2017 estimate for 2017 Yields (170.7bpa) show in black. Average (in orange): 164.9 bpa. Another way of considering trend-adjusted yields (from figure 2) is the departure from trend, or how far above/below average (the orange line) yields are. These departures are shown in order of magnitude in Figure 3. This provides a different perspective of yield estimates over time. Shown in black, the May 2017 corn yield estimate is equal to the 20th largest trend-adjusted yield of the past 58 years; not an attention-grabbing headline. Figure 3. Reported Yield Departure from Trend Yield – ordered by magnitude, 1960-2017. Data Source: USDA NASS. Unfortunately, the statistics do not support this. In figure 4, departures from the average trend yield are shown over time (this is the same data as figure 3, just shown in chronological order). While the USDA’s estimate would make 2017 the fourth year of above trend U.S. corn yields, a couple key observations should be noted. First, above-trend yields are quite common. From 1960 to 2016, above-trend yields occurred 35 years, or 61% of the time. In other words, above-trend yields occur roughly 6 out of every 10 years. Second, clusters of above/below trend yields are common. In fact, during the early 2000’s there were 5 consecutive years of above-trend yields. Also, an often overlooked fact of the recent farm economy boom was a run of below-trend corn yields from 2010 to 2013. While many focus on 2012 singularly, the multi-year scenario was also key to commodity price responses. Figure 4. 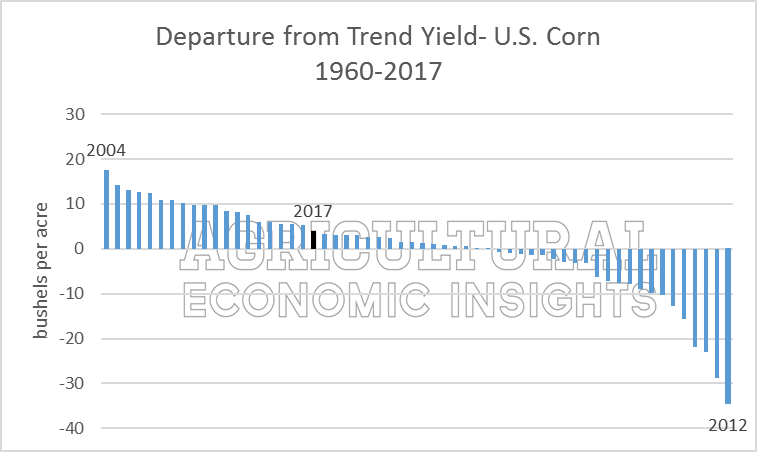 Reported Yield Departure from Trend Yield shown by Year, 1960-2017. Data Source: USDA NASS. While not a perfect example, there is an important reminder about flipping a coin. If your buddy is flipping a coin and gets heads three times in a row, the probability of the fourth flip also being heads remains 50/50. Even though the odds of flipping heads four times – or 400 times – in a row is low, the ‘next flip’ is independent of – or unaffected by – the earlier coin flips. Again, the example of flipping a coin is much simpler than corn yields and global weather trends, but the statical lesson of prior outcomes and probabilities of upcoming events is important. Just because a long run of above/below trend yields might be rare or uncommon, that alone likely doesn’t have a major impact on the odds of next year’s yield. With planting season underway across the Corn Belt, conversations will begins to focus on the growing season and how large (or small) the U.S. corn crop might be. Trend-adjusted yields are important when making historical references. While the USDA’s preliminary estimate (driven by stated methods using historical data) of 170.7 bushels per acre seems large at first glance, trend adjusted-yields reveal the estimate is nowhere near record breaking. It’s also important not to focus on the recent yields when making estimates or guesses about how 2017 might play out. While 2017 could be the fourth consecutive year of above-trend yields, not much weight should be placed on this fact. Multi-year runs of above/below trend yields are not uncommon. Furthermore, above-trend yields are quite common, occurring more than 60% of the time. Finally, a myth we discussed last year is worth briefly mentioning again. A shift in corn or soybean acres (and the states that plant the shifted acres) does not meaningfully affect overall U.S. yield potential. This is contrary to what we hear people saying all the time. Our post outlines the details, but the results are quite interesting.